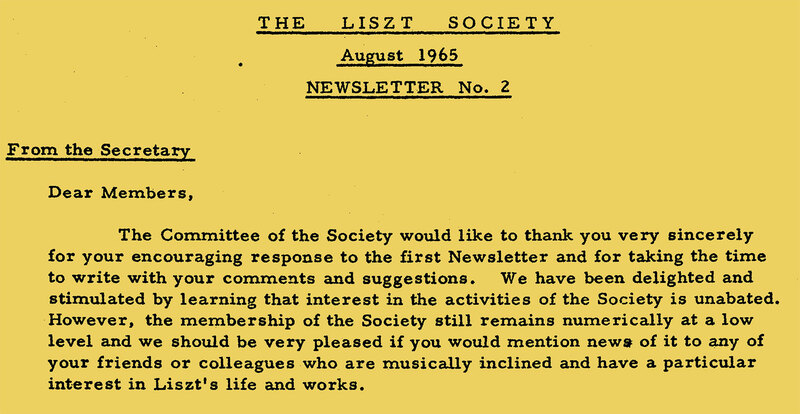 The Liszt Society has used its newsletters to communicate with the membership since the mid-1960's, even before the re-launch of the Society in 1970 in the form it is today. In the early days the newsletters were larger publications as there was no Society Journal. With the inception of the annual Society Journal in the mid-1970's the newsletters became more variable in size. They were published without a set schedule and gave members information on Society events, people and publications, plus reviews of concerts and recordings etc. All past newsletters have been collected together in a hard-copy archive and have additionally been scanned to provide a browsable resource for anyone interested in the history of the Liszt Society. These can be individually downloaded in pdf format by clicking the link to the right of each newsletter listing. Newsletters published in the most recent 12 months are only made available to current members of the Society. New members joining the Society will be sent all recent newsletters. PDF format for electronic distribution to members. UK subscription raised to £25. Intention to publish by email in future announced. Jan Hoare resigns as Secretary and publishes his final newsletter.Andrew King appointed Membership Secretary. Deaths of Pauline Pocknell, Elsie Harrison, Noel Coleman. Review of Christus in Leicester. 16 page edition covering Society members visit to Weimar. Obituary on death of Vernon Harrison on 14/10/01. Information Sheet - Liszt's Violin Music. Leslie Howard gives Liszt birthday Wigmore Hall recital. Arthur Mason resigns as Chairman, succeeded by Elgin Ronayne. Death of Keith Fagan. No Winter Newsletter possible due to flu. Secretary George Morvay resigns. Leslie Howard's Hyperion CDs reach number 35. Death of patron Geoffrey Parsons. Leslie Howard's Hyperion CDs reach number 30. Society patron Yehudi Menuhin receives a peerage. Stuart Hudson takes over as Treasurer. Matthew Brooks succeeds Audrey Ellsion as Secretary. Leslie Howard plays 'Liszt at the Opera' at the Hungarian Embassy. 40th Anniversary concert of the Society held at Austrian Institute, Nov 10th 1991. March Hongroise reproduced on page 2. Leslie Howard's Hyperion CDs reach number 15. Vernon Harrison steps down as Chair. Paul Gregory elected Chair. Leslie Howard elected President. John Davies appointed Activities Officer. Eunice Mistarz retires. Audrey Ellison takes over as Secretary.